Halaqa groups can be intimidating. I do not have every part of the Quran memorized, and when sisters start naming one surah after the other, I feel shy asking what she meant. A halaqa should be a place free of judgment where sisters can bring up their perspectives in their relationship to Islam. That may not always be the case. In fact, seeing the word may even bring a bad halaqa experience to our mind. A few weeks ago, Time magazine featured four Muslim American women in a national series with a title reading “Inside a Millennial Women’s Quran Study Group” for their non-traditional take on a halaqa. The group was formed in 2016, with four women leading the group and inviting others to join in the monthly sessions. In 2016, four inspirational, professional Muslim women created a space they always needed as a young Muslim woman navigating the world. Henna Qureshi is a 34 year old pediatrician and first generation Pakistani-American working with low-income patients in the U.S. and refugees abroad. Nafisa Isa is a 31 year-old Bangladeshi-American program manager at the Smithsonian Asian Pacific American Center and social activist. Freshta Mohammad was born in Afghanistan, identifies as Shi’a, and is a 33 year-old Chief-of-Staff at a consulting firm. Adeela Khan is a 33 year-old director at the American College of Cardiology. In her free time, she volunteers with a nonprofit helping to build social mobilization and education programs in Pakistan. The beauty of this group is that even though these four women are from the same age group, they come from such unique upbringings to truly add to the conversation. At 10 p.m. amidst a Skype chai hour, I interviewed these four women to learn about what the Times feature meant not only for them, but Muslim women and girls everywhere. Let’s talk about Muslim Role Models. “We didn’t have real Muslim female role models in mainstream media growing up and if there was, I couldn’t relate to their practice or lifestyle” shared Nafisa. Islam shows up differently for all of us, with being one of the fastest growing religions in the world – it is amazing to see all different types of Muslim women. “We can even take a look at your scholarship categories, you are encouraging and seeing the differences in Muslim women: undocumented, LGBTQAAI, and black Muslim – you are stating that they do exist and they do deserve the same opportunities as everyone else,” added Henna. How different would it have been if you had this group in your twenties? Nafisa shared “We have these conversations about faith, personal growth, philosophy, theology, all the stuff that you would expect, but we also paint unicorns.” Our twenties and thirties are exciting times of transformation and change but also full of fears and insecurities about ourselves and how we show up in the world navigating towards an unknown future. “I didn’t necessarily have a group like this that I have been a part of before. I was part of the MSA, but the format and goals were a little different. If this group was there for me when I was younger, I think I would have been able to process things a lot better” shared Freshta. How to create your own halaqa? “There are more cases of suicidality and domestic violence in the media. Life is tough now, it is significantly harder than when we were growing up. The expectations for kids to act as adults feels more apparent. Girls these days are managing societal pressures and their own insecurities. We need more spaces like this to celebrate each other” shared Henna. “I love that our group is a mix of Sunni, Shia, Sufi, but we also reference spiritual influences from a multitude of sources, ranging from poetry to nature” Nafisa described. 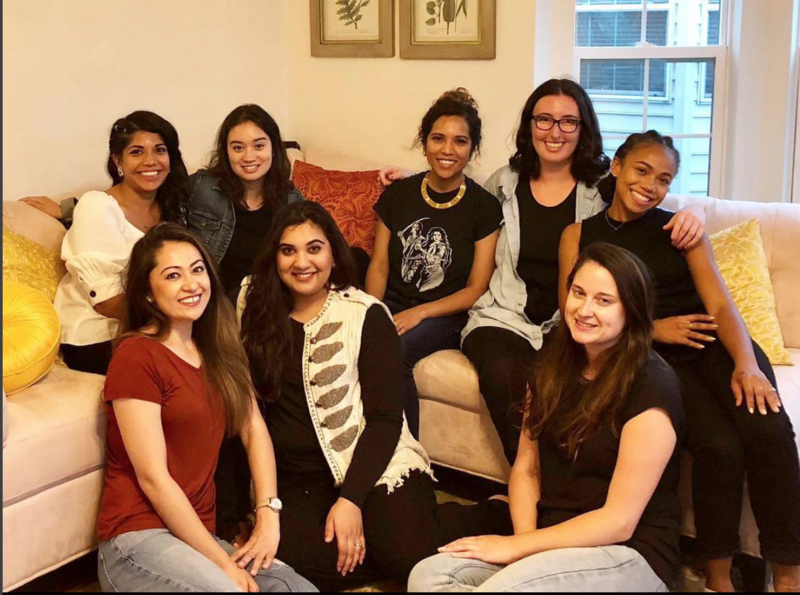 By sharing their story, they want to continue this conversation with other Muslim women out there also growing up in an myriad of different cultures by developing a toolkit to help them create their own groups. To take part in learning how to create your own, click here.